In his controversial bestseller Darwin’s Black Box, biochemist Michael Behe challenged Darwin’s theory of evolution, arguing that science itself has proven that intelligent design is a better explanation for the origin of life. 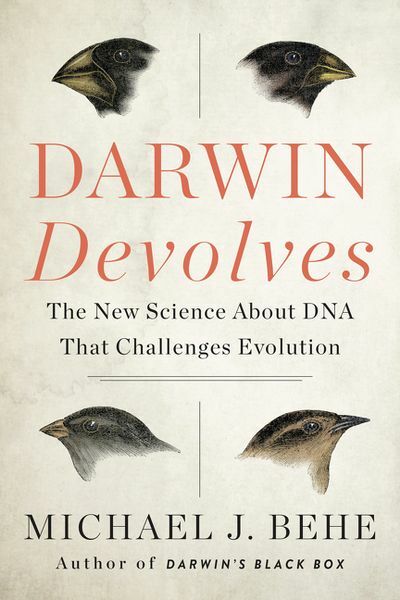 In Darwin Devolves, Behe advances his argument, presenting new research that offers a startling reconsideration of how Darwin’s mechanism works, weakening the theory’s validity even more. A system of natural selection acting on random mutation, evolution can help make something look and act differently. But evolution never creates something organically. Behe contends that Darwinism actually works by a process of devolution—damaging cells in DNA in order to create something new at the lowest biological levels. This is important, he makes clear, because it shows the Darwinian process cannot explain the creation of life itself. “A process that so easily tears down sophisticated machinery is not one which will build complex, functional systems,” he writes. In addition to disputing the methodology of Darwinism and how it conflicts with the concept of creation, Behe reveals that what makes Intelligent Design unique—and right—is that it acknowledges causation. Evolution proposes that organisms living today are descended with modification from organisms that lived in the distant past. But Intelligent Design goes a step further asking, what caused such astounding changes to take place? What is the reason or mechanism for evolution? For Behe, this is what makes Intelligent Design so important.